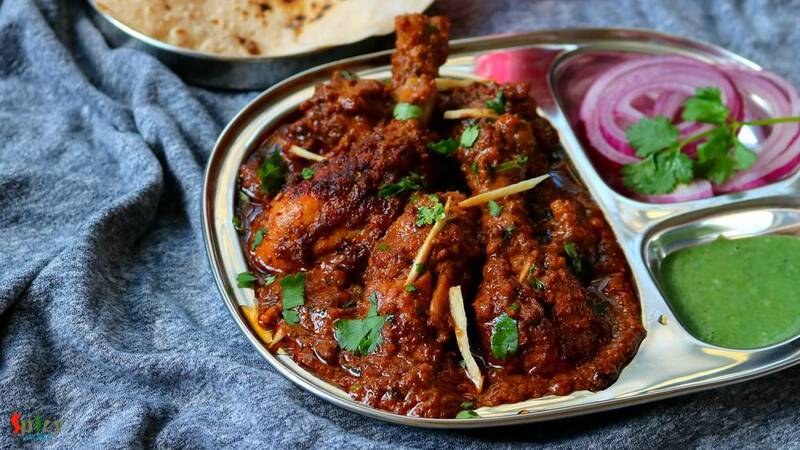 Chicken Changezi has a rich, chatpata (spicy and tangy) and very delicious gravy which goes best with plain flatbread or naan. 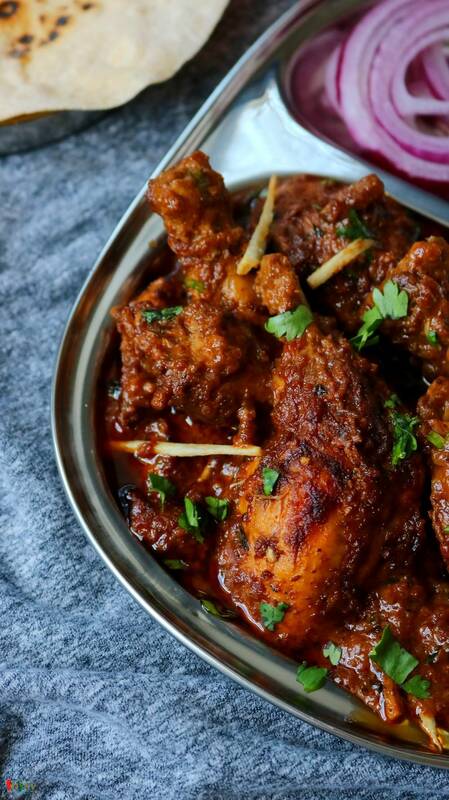 Changezi Chicken is a popular dish in Delhi. Almost every non veg restaurants and dhabas sell this dish. 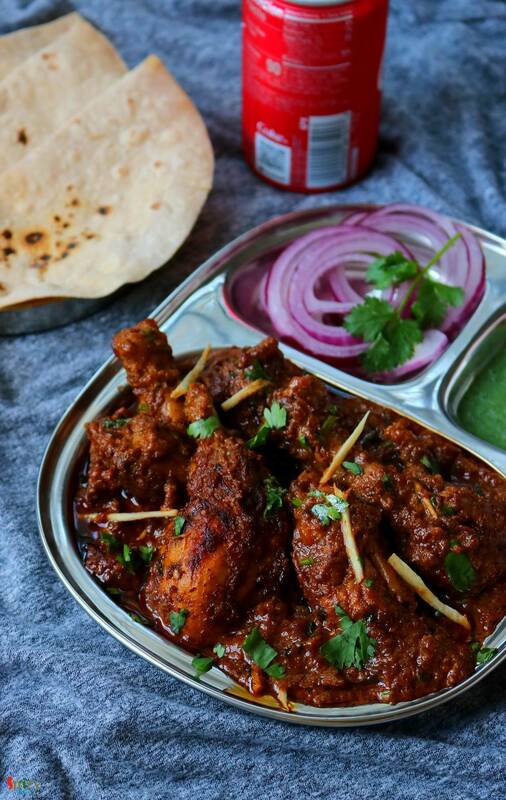 In this recipe lightly fried chicken will be cooked in a brown onion and nut based gravy and to make it chatpata, we will add chaat masala, lemon juice, green chilies and what not! Enjoy the recipe with video. 1 kg with bone medium cut chicken pieces. 2 medium onions, thinly sliced. 3 Tablespoons of ginger garlic paste. 2 Tablespoons of red chili powder. 2 Tablespoons of roasted coriander powder. 1 Tablespoon of garam masala powder. 2 Teaspoons of chat masala powder. 6-7 almonds or cashews (soaked in water). 2 Teaspoons of kasuri methi. 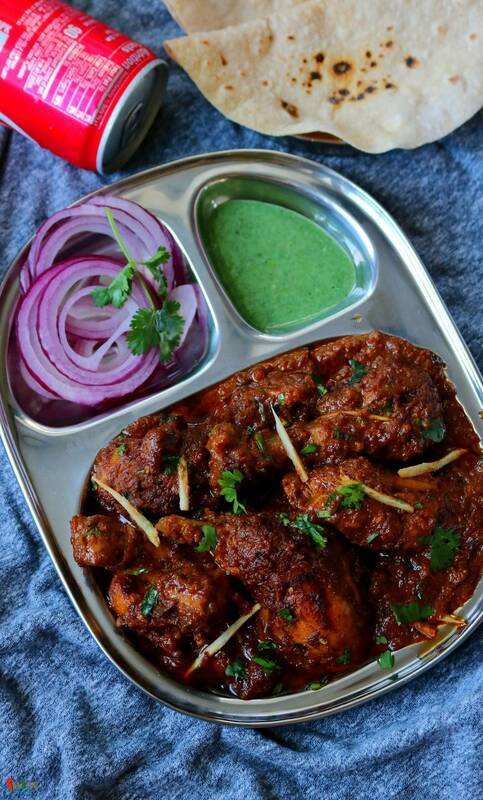 Marinate the chicken with yogurt, 1 Tablespoon of ginger garlic paste, 1 Tablespoon of red chili powder, 1 Tablespoon of roasted coriander powder and some salt. Mix well and keep it in the refrigerator for 2-3 hours. Heat half cup of oil in a kadai, fry the onion slices in batches until they become golden in color. Remove them from oil and keep them in a paper towel lined tray. Put the fried onion in a mixer grinder along with soaked nuts and little water. Make a smooth paste and keep aside. Heat 3-4 Tablespoons of oil in a pan. Add the marinated chicken pieces. Fry them for 5 minutes on medium flame, when the chicken will become lightly golden turn off the heat. In another pan heat 4-5 Tablespoons of oil. Add the remaining ginger garlic paste, cook for 2 minutes on low flame. Then add tomato puree and cook for 5 minutes on medium flame. Next add the remaining red chili powder, coriander powder, 1 Teaspoon of chat masala and garam masala powder. Mix well on low flame for 2 minutes. Then add the onion and nut paste, cook for 5 minutes on medium flame. Then add the milk, mix for 2 minutes. For the seasoning add some salt and half Teaspoon of sugar. Mix well for a minute. Now add the cooked chicken, mix well for 5 minutes. Add the hot water, cover the pan and cook for 15-20 minutes or until the chicken becomes soft. Then add kasuri methi, heavy cream and slited green chilies. Mix well for 2 minutes. Turn off the heat and add 1 Teaspoon of chat masala, ginger pieces, coriander leaves and lemon juice. Your chicken changezi is ready to serve. Serve this hot with naan or flatbread.